This posting is part 2 of a 3-part series highlighting how BoneStation can reduce costs, save time, and improve quality in BMD reporting. In the previous blog, we emphasized the cost savings aspect. Here we focus on the time aspect, or the speed of reporting. Bone Densitometry using DXA has been around for a while. As we all know, a particularity of BMD scans is that they output images (spine, hip, etc) as well as numerical values (BMD, BMC, T-score, Z-score, etc…). Even today we occasionally observe situations where readers do not compare scans with priors and do not calculate changes in BMD. The International Society of Clinical Densitometry (ISCD) recommends these as important elements of a bone density report. Perhaps it takes too long to provide this information in a report. However, BoneStation makes it easy. This BoneStation video illustrates how quickly a reading physician can review a spine and hip DXA study, including FRAX. An actual review, with prior scans, can often take under one minute with BoneStation. With the narrative in the accompanying video, it takes about a minute and half to review a spine/hip. We hope that this brief blog helps you think through your bone densitometry process. BoneStation has produced more than a quarter million reports and has proven to be reliable solution for BMD reporting. Customers such as MGH, Swedish Medical Group, Emory and others enjoy higher throughput and quality at lower cost. The physician has interpreted the bone mineral density (BMD) test and generated the report. Now what? Obviously it needs to be sent or “distributed” to the interested parties. In this article we look at this distribution phase, which is sort of the “last mile” in the reporting process. Who will be the final “consumers” of the report? Does the facility have an Electronic Medical Records system (EMR)? Who has access to the EMR? Let’s dive a little more into these questions. The final consumer of the report is typically the ordering physician i.e. the physician who prescribed a bone mineral density test for his/her patient. Usually it is the primary care physician, although other doctors treating the patient may also need to see the report. The EMR, however, may not be available to all physicians who need to access test results. If the ordering doctor is located in the hospital where the BMD test occurs, he/she is then connected to the EMR. But the ordering doctor could be external to that hospital or even located in a remote office with limited access to the EMR. What is then the best way to distribute exam results, such as bone density reports? As mentioned above, other doctors than the ordering physician may need to receive the patient’s report. This is very easy to set up with BoneStation thanks to its distribution list functionality. For the sake of traceability, the complete history of each report, recipient, distribution method, and distribution date/time is stored in BoneStation. The hospital staff can quickly and easily review that historical data. 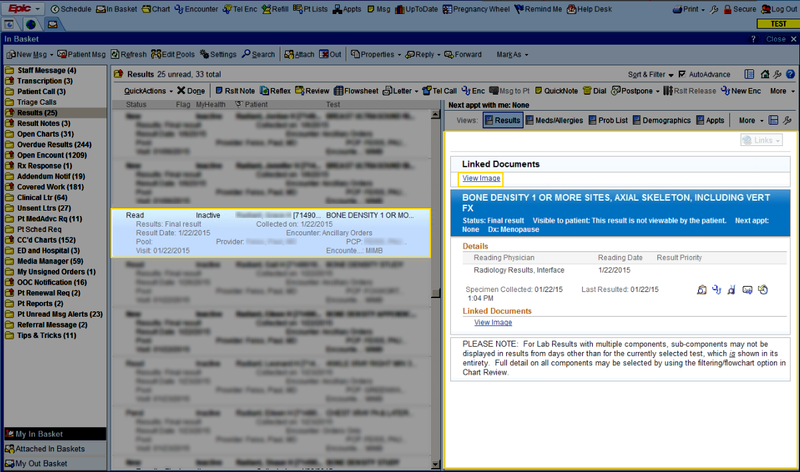 BoneStation offers the necessary flexibility for distributing BMD reports. It support traditional methods, such as print/mail and fax, which are still needed today, in addition to the modern solution of interfacing to Electronic Medical Records systems. In today’s fragmented healthcare landscape it is important for vendors to offer flexible solutions to accommodate different situations, not only within the medical office or hospital, but also at the interfaces between stakeholders. We have learnt that even in the very specific case of the distribution of BMD reports, there can be many scenarios that need to be resolved, and we will continue to address the constantly evolving landscape. This posting is the second in a series that discusses cloud based computing and benefits to bone density providers. For a brief description of The Cloud and cloud based computing, see our earlier posting. In this article we’ll focus on workflow. A typical bone density department has several participants involved in processing bone density scans. A cloud-based system can make an entire team function more efficiently and smoothly. Each participant interacts at a different phase in the scanning and reporting process and can be prompted to perform their part of the work at the appropriate time. Here is a screenshot of the workflow process in BoneStation. The first column is the patient; second column shows the scans, and the third column is the exam status. Of course, the tasks can be sorted and filtered by the status. This screen shot demonstrates work to be done and where each exam is in the process. Each participant can then focus on their tasks in moving the exam through the process. A technologist will be interested in Exam Pending, which means that BoneStation is awaiting for a scan(s) – in this case a hip scan. When the hip scan arrives the exam goes to Exam Ready. Exam Ready indicates the exam is ready to be reviewed. Being Reanalyzed means the reviewing physician has requested a reanalysis. Reviewed means a report has been created and it needs to be distributed and/or printed. Cloud based software lends itself to making teams more productive. Multiple users have access to the same information and processes. This is difficult to achieve with desktop software, which typically isolates users from each other. Managers of bone densitometry practices have the challenge of managing bone density (DXA) machines and a variety of health information systems. The most widely used systems include Radiology Information Systems (RIS), Hospital Information System (HIS), Picture Archiving and Communication Systems (PACS), and Electronic Medical Records (EMR) systems. We describe the workflow of a typical bone density office and how these systems integrate with each other. 1) A bone density exam is scheduled by a bone density office staff, who enters the future exam date and patient information in the radiology information system. 3) A DXA technologist scans the patient on the bone densitometer. Patient information may be manually entered into the software for the DXA machine. Some information such as date of birth, ethnicity, and gender are required clinically. With functionality called DICOM worklist, the exams and patient information can be made readily available to the technologist by transferring it from PACS to the DXA machine. After the bone density scans are performed, the technologist analyzes the scans and transmits them to BoneStation’s database. Scan images may also be sent to the PACS, which is often the central repository for all medical images produced at a center. 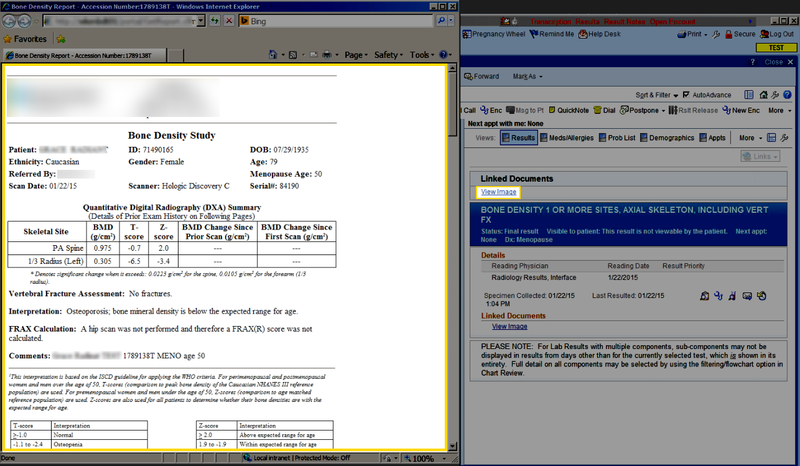 4) Next, a bone density specialist reviews the DXA scans from the BoneStation web application. The physician logs into BoneStation and views the list of scans to be reviewed. Each scan that is reviewed results in an automated bone density report. 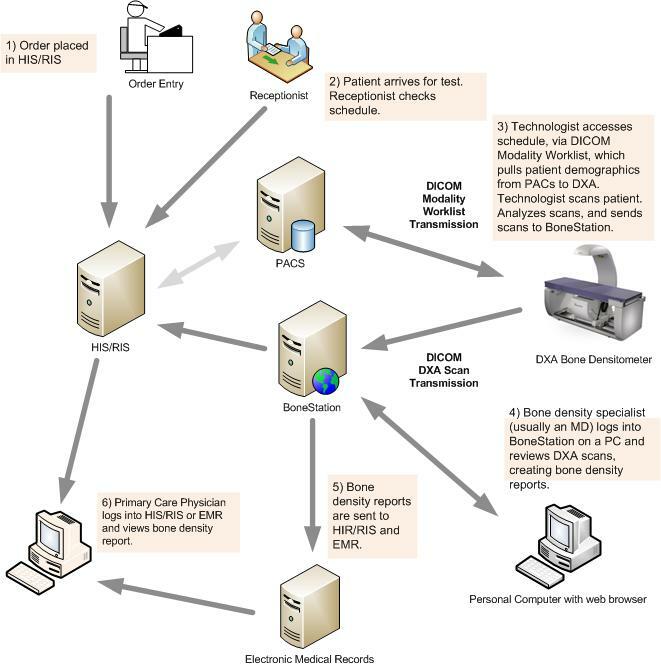 5) BoneStation transmits the scan data, image and report to the HIS, RIS, or EMR. The actual destination varies based on the system used to provide results to primary care physicians. 6) Primary care physicians log in to their HIS, RIS, or EMR to check for patient results. The purpose of PACS is mainly to store images. HIS, RIS, and EMR systems usually have different functions. In terms of results, these systems usually store just text. Many PACS systems provide the ability for HIS, RIS, and EMR systems to link to PACS, in order for primary care physicians to view images.